The fastest way to pack a lunch box. Guaranteed. Container lids stay put, but can be easily removed by toddlers. (Not leak-proof). Please do not use with liquid or runny food items. Durable and reusable, the containers are of much heavier quality than similar 'take and toss' products and will last through many months of waste-free lunch packing. Made from FDA-approved, high-quality polypropylene No.5. No BPA, PVC, or phthalates. Microwave, freezer and dishwasher safe. Almost any menu can fit into the compartments. Foods keep separated and don't "touch". Perfect for people with allergies who need breakfast, lunch, and/or dinner packed gluten-free, nut-free, etc. 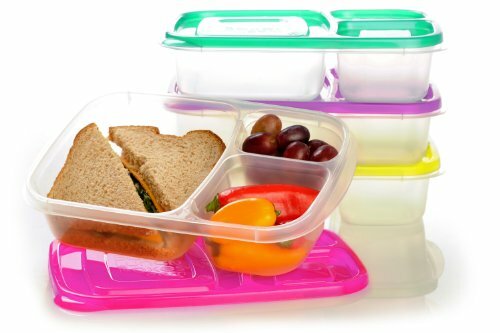 EasyLunchboxes make dieting and portion control easy-just the right amount of food, without having to weigh or measure meals. Quickly assemble healthy and delicious meals to go for school or office lunches, as well as travel, picnics, or family outings. Pack them in the EasyLunchboxes Cooler along with a water bottle, ice block, extra snacks, even a thermos. (Up to three of these compartmentalized food savers fit in the EasyLunchboxes cooler bag.) Each container is 9.4" x 6.1" x 2" Compartment capacities: Large section-2.5 Cups, Smaller section-3/4 cup, Smallest section-1/2 cup. Inside of the largest compartment is approx. 4.5" x 5" Inch and 1.75" deep. (Not leak-proof. ).